I've been going through a bit of a hair rut recently. My hair just wasn't looking as good as it usually does and I put it down to using the same shampoo and conditioner for well over 6 months now. 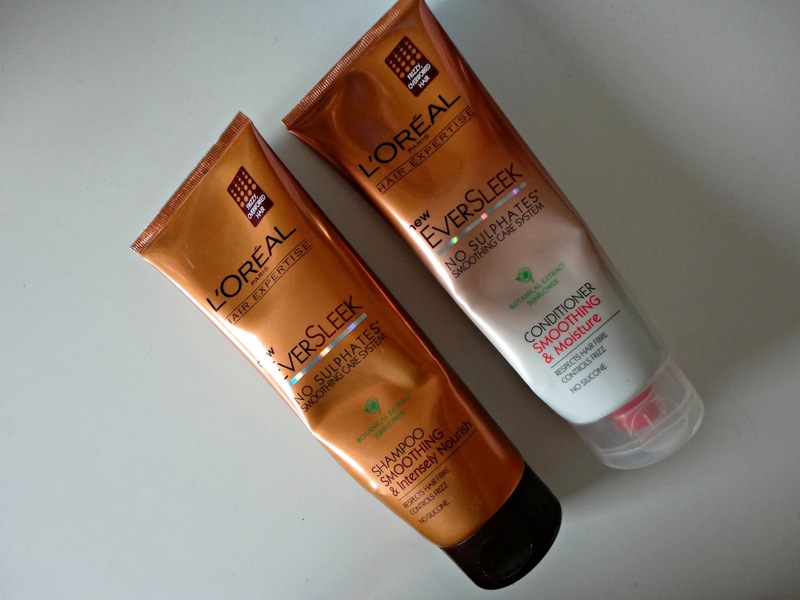 I thought it was time for a change and so I dug the L'Oreal EverSleek Shampoo and Conditioner out of my collection. I bought these a while ago but got too scared to use them after reading mixed reviews. So, after using them for a couple of weeks, I thought I'd share my thoughts. These products don't contain any sulphates, making them supposedly better for the hair and preventing frizz - which can be a problem for me. My hair tends to need a wash every 3 days, and these sounded perfect to me: anti-frizz and nourishing. First of all, the shampoo is super thick, it almost has the same texture as a conditioner. It doesn't lather up too much either, which didn't bother me really, but you have to make sure you properly massage it in. I shampoo twice, then apply the conditioner to the mid lengths and ends. The conditioner has a much lighter texture and I would definitely say I prefer that to the shampoo, as when I washed it out, my hair felt nice and smooth. However, when I'd finished, my hair still didn't really feel clean, and as I continued to use these products, I felt like product was beginning to build up in my hair. Now, I didn't change anything else in my routine, and I only ever use serum and heat protectant on my hair, so I knew it had to be down to this. I also noticed that by Day 2, I really wanted to wash my hair again, as it looked so flat and almost greasy, even though my hair never usually gets like that. So, I had to research other options and I've now stopped using this duo. I'm pretty disappointed as they sounded like the perfect product, but with such thick, curly hair, I really can't deal with washing it every other day. I have now switched to a different shampoo, and am still using this conditioner and so far, so good. I think that the shampoo is what the problem was, but I'll do an update in a month or so and see how it goes! Let me know if you've tried any sulphate free hair products and what you thought!